We’d love your help. 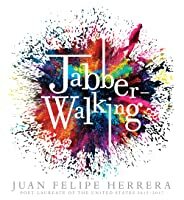 Let us know what’s wrong with this preview of Jabberwalking by Juan Felipe Herrera. Can you walk and talk at the same time? How about Jabberwalk? Can you write and draw and walk and journal all at the same time? If not, you're in luck: exuberant, blue-cheesy cilantro man Juan Fe Juan Felipe Herrera, the first Mexican-American Poet Laureate in the USA, is sharing secrets: how to turn your wonder at the world around you into weird, wild, incandescent poetry. To ask other readers questions about Jabberwalking, please sign up. Not too long ago I taught a six-week summer creative writing course for teens. Now I’ve never taught creative writing before. Truth be told, I had no idea where to start. So, like any good librarian, I hit the books. My idea was to take a different book each week and use it as a creative writing guide for the kids. And since these were teens we were talking about, I mixed up the reading levels on the guides. As a result they took deep dives into The Creativity Project, Writing Radar, Spilling Not too long ago I taught a six-week summer creative writing course for teens. Now I’ve never taught creative writing before. Truth be told, I had no idea where to start. So, like any good librarian, I hit the books. My idea was to take a different book each week and use it as a creative writing guide for the kids. And since these were teens we were talking about, I mixed up the reading levels on the guides. As a result they took deep dives into The Creativity Project, Writing Radar, Spilling Ink, Bird by Bird, On Writing, and The Secrets of Story. Now on the first day I asked the kids what they liked to write. I got some fantasy, some realism, some humor, and more than one kid said poetry. Poetry. Huh. Well that hadn’t really occurred to me, but sure, that’s creative writing all right. Only, instructional poetry books, besides being few and far between for this age level, weren’t really on my pre-written recommended reading list so I sort of skipped over that aspect of writing. I’m telling you this because of the foot-shaped dent in my lower left shin where I’ve been kicking myself ever since. If I’d been on top of my game I would have realized, the moment those young people said “poetry”, that I was in the unique position of having already seen, what I think may be safely called, the strangest, bravest, weirdest, mind-trip of an instructional poetry guide I’ve ever seen in my whole friggin’ life. Look, if you want a poetry guide that’s going to tell you how many syllables are in a haiku and what a “stanza” is, look elsewhere. If, however, you want an instructional poetry book that feels like what happens when a zine consumes a human from the inside like a xenomorph in Alien and releases an explosion of heat and heart and light and life, there’s really only one choice out there. And it’s from a former National Poet Laureate too. This is the part of the review where I describe the book. This is the part of the review where I put on my Very Serious Writing Fingers and type out a Very Serious Description that uses lots of long words but does not, no matter how much I want it to, copy the publisher’s blurb. Normally, this is the part of the review I write last because it’s the easiest part. Today it’s the hardest. I’m going to have to try to encapsulate something that doesn’t really want to be encapsulated. So . . . let’s try this. Imagine you were looking at a painting that made you feel inexplicably melancholy. Someone walks up to you and asks how you’re feeling. You tell them, but looking at the same art they can’t feel what you feel. It’s a personal moment for you and just you. Poetry is the same way, but with words, and Juan Felipe Herrera wants to give kids and teens the tools to make it something that frees them in some way. But he also wants to give them some advice on the matter. The solution, as he sees it, is to weave his own story, about going to Washington D.C. and his youth with odd fictional moments and advice given in as eclectic a style possible, telling kids to get up, get moving, get writing, get reading, get to making something of their own. The end result is messy and big and exactly what you need if you want to hotwire a kid’s gray matter into action. So poetry for kids and teens is hot right now. Don’t ask me why. I have a couple theories but nothing too concrete. It could be that it has something to do with Kwame Alexander’s unrelenting promotion of the form. It could be that poetry is the voice of rebellion and right now we need a little more rebellion in our lives. It could be a confluence of some kind of cosmic convergence in the heavens for all I know. Whatever it is, we may be approaching some kind of a poetry renaissance in children’s literature these days because this book blows to high heaven those preconceived notions of what constitutes “poetry” today. A lot of kids have only ever encountered poetry in its various rigid forms. This is good. You can’t break the rules until you know the rules, after all, so I imagine that encountering Jabberwalking for the first time will be a freeing process for them. If they're capable and willing to try to pick up what it's laying down, of course. When I select a book for kids and decide whether or not to read it, I have this weird process where I try to dive in without any preconceptions. I avoid bookflaps and reviews (as much as possible) and blurbs. Now in my mind, this means that I’m approaching the book fresh, but what actually happens is that my brain, lacking for any kind of tangible or concrete information, starts speculating wildly about what the book might be about. In the case of this book I sort of flipped through the pages, saw it had starred reviews, and came to the not wholly ridiculous assumption that it was some sort of large format poetry book. Not an unreasonable conclusion to draw. Imagine my confusion then when I started to read. I think my thoughts went in the order of, “Wait, is this nonfiction? A memoir? No, it’s . . . is it poetry? No, it’s doing something else. What is it doing?! ?” What it’s doing is instructing through action. Show don’t tell, they say, but if you can pull off both at the same time, why not try it? So it was that after an inordinately long amount of time I finally figured out that this was a poetry writing guide, after a fashion. But as I mentioned, I’m used to staid, serious, rote writing guides that are meant to guide kids to write fiction or nonfiction. Poetry, as it turns out, is a whole other kettle of fish. What Mr. Herrera is doing here . . . okay, I had to cheat to find the right way to describe it. Let’s go to the professionals, shall we? Horn Book said the messiness of the text, “send[s] the message of encouraging young writers to let their words flow unstopped by convention or constraint, and to allow themselves to jump around and go on tangents and not worry about it.” Kirkus said the, “metafictive exploration of the poetic process dips in and out of imagined reality as easily as the Cheshire Cat winks in and out of sight.” PW said it shows how, “riotous verbal exuberance births poetry.” And all the while you’re watching as the poet talks about his own life and then leaps to fictional parts involving a Jabber Girl named Zandunga García from Bunion Junction, then to instructions for writers and around and around again. It’s dizzying and freeing all at the same time. He’s basically just giving readers permission to do whatever they want on the page. For a lot of them, it’ll be the first time anyone’s ever even suggested that such a thing could be done. Trying to compare this book to any other book out there is a bit difficult. I think it’s fairly safe to say that it’s literally unlike any book published with kids in teens in mind in America before (from a major publisher anyway). The closest approximation I’m able to come up with is maybe Shel Silverstein meets Ulysses. The Ulysses part of that is pretty self-explanatory, what with the stream of consciousness that isn’t actually a stream of consciousness. The Silverstein has more to do with the tone (Uncle Shelby would definitely have approved of Jabberwalking) and the art. And the art isn’t something that you might think much about but as far as I can tell (and I have scoured the publication page of this puppy until there wasn’t a word left unscathed) Mr. Herrera did the art himself. Now how about that! A Poet Laureate that is also someone with a wacky urge to doodle outside his own margins. Of course nobody’s quite sure what age to market this to. The publisher (Candlewick) was selling it pretty clearly for kids in the 9-12 year old age. Kirkus Reviews, however, said 12-16, no bones about it. Publishers Weekly said 10 and up, School Library Journal said 7th grade and up and frankly nobody agrees on nuthin’. Of these, I’m going to side with PW on this one. While it is true that teens might have more patience sticking with Herrera as he jumps, leaps, and bellyflops from one idea to another, do you remember that writing course I gave for teens? Well as any good librarian will tell you, do any kind of program for older kids and you’ll get younger ones just clamoring to take part. At least half my classes were filled with “teenagers” ← note the quotation marks. These kids were smart as whips, creative as all get out, and they would totally eat up what this book is dishing out. So as far as I’m concerned this is a book for anybody with a yen to give it the old college try. Because at its heart, Herrera is putting his mouth where his money is. He’s doing everything in his power to show the messiness of poetry in its roughest forms. To show how poetry is something raw and spontaneous and as much a feeling as a form. He’s actually making as clear as anyone can why people love poetry. The end result is that this book isn’t going to be for everyone. You’re going to get a fair number of kids (maybe those haiku lovers) that get three pages in and then call it “weird” and walk away. But for every five or ten or maybe even twenty kids that turn away, there’s going to be this one that can’t resist it. That colorful splatter on the cover. The heft and size of it, like even the publisher understood that the words on show here needed something substantial for maximum importance. And when the man writing this book tells you that “Your burbles are going to become a Seismic & Crazy Epic Poem!” that kid is going to believe what he says. Maybe write more poetry. Maybe write better poetry. Maybe start walking and observing and drawing on the parts of their lives that they never thought they could write about. And maybe something inside this book is going to stick with them for a long long time. Mr. Herrera could have written a normal instructional book for young writers. Instead he decided to fill his readers’ “burrito head[s] full of incandescent Sparkles” with fire and frenzy and risk and flavor. It doesn’t all work. Writing doesn’t. But if you seriously have a kid that wants to write poetry and isn’t afraid to take the advice of a man that can write a phrase like “crazy, fuzzy, putrid blue-cheesy planet-frijol-bean” with a straight face, there’s nothing else you can hand them BUT this. And that’s the Jabberwalking truth of the matter. It's difficult picking a rating for something where you enjoy the message and meaning of a work (don't hold back creatively, embrace your voice, embrace your weird), but you don't necessarily dig the way it's presented. That's where I'm at with Jabberwalking. I'm not a big fan of the weird crazy nonsense poetry here, but I appreciate the message and meaning. Pretentious and inaccessible. Tedious and exhausting. This is why so many kids hate poetry. If you like poetry and nonsense words then you will love Jabberwalking. Part poetry, part instructional guide, all fun. I hope junior high students understood and found the process useful. It looked fun but I could not get into the swing of it. It has a delightful layout and talks about writing -- both good. It makes no mention of electronic media and I feel certain that was a deliberate action that took much determination. Lewis Carroll’s inspiration is undeniable in this book which is part story, part handbook, and packed with nonsensical words and phrases. Candlewick described this book at Herrera's advice to young poets. Great add-on for kids who got hooked through Kwame Alexander. This book makes you want to let go of conventions and fear and write, write, write! Woven in is his story, the story of growing up in a family of migrant farm workers who were also musicians and word lovers, and his amazement that he became US Poet Laureate. JABBERWALKING opens your eyes to a new way of creating poetry. The trick is to scribble all of your nonsense words down while walking fast. The can be completely random and beautiful at the same time. The author teaches that you shouldn't hold back and you never know what masterpiece you can create if you don't try. The author wants you to use all of your senses while walking fast. Write what you here and write what you see. This book is the key to learn how to become a Jabber-Walking expert. 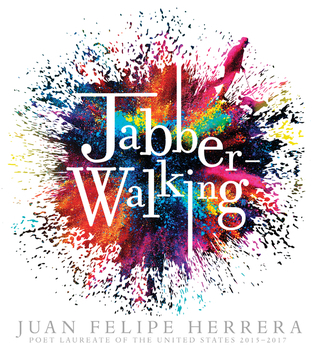 JAB JABBERWALKING opens your eyes to a new way of creating poetry. The trick is to scribble all of your nonsense words down while walking fast. The can be completely random and beautiful at the same time. The author teaches that you shouldn't hold back and you never know what masterpiece you can create if you don't try. JABBERWALKING sparks your imagination while getting you out of the house and on the move. This book was a little hectic, but it is quick to catch your attention. This may just be the way to open up the new generation's eyes to the beauty that poetry can be. I also absolutely love the colorful cover. What fun! I'm so glad my wide awake in the middle of the night brain chose this one from the 2015-2017 Poet Laureate of the United States. When you open this book you should expect to be taken by the hand and pulled quickly into a world of fast paced, write it as you think it, poetry. The coolest part, cooler than learning about Herrera throughout the book (which was pretty darn cool) is that he urges you to join in on the fun! As a teacher I felt the ideas literally buzzing around my head. How I What fun! I'm so glad my wide awake in the middle of the night brain chose this one from the 2015-2017 Poet Laureate of the United States. Language – G (0 swears, 0 “f”), Mature Content – G; Violence – G; Herrera talks directly to readers in this book of jabberwalking poems. As he talks with readers, Herrera also teaches his readers how to jabberwalk and write poems like he does. Hurry! You’ll get left behind if you can’t keep up. The poems and narrative told through those poems are very disjointed and confusing. I didn’t understand what was going on in the first couple of chapters, then I thought I understood what was going on, and Language – G (0 swears, 0 “f”), Mature Content – G; Violence – G; Herrera talks directly to readers in this book of jabberwalking poems. As he talks with readers, Herrera also teaches his readers how to jabberwalk and write poems like he does. Hurry! You’ll get left behind if you can’t keep up. The poems and narrative told through those poems are very disjointed and confusing. I didn’t understand what was going on in the first couple of chapters, then I thought I understood what was going on, and then I was lost again as Herrera continued with his half-baked ideas. If I learned anything from this book it’s that anyone can write a book. A new take on poetry! This book is underrated, and it deserves to have more attention. I have never heard of "jabberwalking," but the concept itself sounds really interesting and unique. It is a quick read, but it definitely gives you something new to try out. I know I will definitely try this in my free time since I am a poet myself. I mean, getting a workout AND writing some sweet poetry? Sounds like a dream come true. It never hurts to try something new. Study the intentional explosion of bright cover-art color, with the whimsical addition of a man walking a dog. Add in what you already know of Lewis Carroll's nonsensical poem Jabberwocky. Stay out of the deep end of the Meanings ocean, and instead, let the lyrical text give you a fresh insight simply into writing poetry. Read the pages aloud! As with most poetry, these words and their rhythm should be heard rather than read silently. This, this is fun. Although I was tempted to put the book down out of confusion in the beginning, I began to through enjoy the feel of the journey contained in Jabberwalking. An added bonus, this book got me to look up and learn about the position of Poet Laureate along with several other curious facts. A simply delightful light reading sharing the spark of design to be creative and exploratory in new art forms. This has roots and wings and taxis and blue cheese and the Library of Congress. I'm not sure what it is or how to categorize it, but I like it and couldn't put it down. Brilliant, weird, inspirational and meant to be read ALOUD to and by poets ages 9-14. But definitely not for everybody. In a good way. Jabberwalking is a great book. We always want students to journal, write, write, and write even more. This book embodies that philosophy, and we can learn how to do it by reading Jabberwalking. Thanks to Goodreads First Reads for a copy of Jabberwalking. I'll be purchasing multiple copies for my classroom. Highly engaging, fun, clever, and inspirational "guide" to writing poetry. The book encourages a creative, messy, and open state of mind to get kids to free up their writing process. I will recommend this book to everyone (adults too) who enjoys writing (and especially those who don't enjoy writing) so they too can create "burbles of verbal contortions." Felt akin to Jason Reynolds. I think Herrera is a more accomplished writer than Reynolds, but that actually makes the negative aspects of this kind of writing worse. Except for the one actual, finished poem on pages 72-75, this is no way to model writing, encouraging inclinations of would-be writers that should probably be discouraged. Makes me think Herrera and Lynda Barry should hang out-- or do a panel presentation on creativity-- or maybe they already know each other? In any case, check out her book "Syllabus" for more great stuff on the creative process! This could have been amazing. I wanted it to be amazing. I loved the cover and the summary of the book. I loved the intention and how badly Juan wants kids to get excited about poetry. This; this though is not good. It's confusing and disjointed. It makes one hope it will be over soon. weird and wonderful, beautiful and bizarre. I've never read anything quite like it, but I'm glad I did. steam of consciousness/ class in creative writing. a lovely find at the library & plus I love the cover art. Herrera wrote this book to inspire children to write and doodle while walking around in order to channel their inner poet selves. It is goofy and fun to read, and could inspire children to try writing poetry and playing with language. For kids who need an introduction to nonsense verse and not being afraid to write down whatever thoughts drip from their brain, this book is a great start. As a bonus, it reads in such a way that it fills you with a buzzing energy you can't deny. Such a fun idea for poetry! I loved his different catch phrases like blue-cheesy or hurry! Hurry! The whole premise is walking and writing at the same time. I would love to do this as a poetry unit with children. Great cover art too! Poet laureate has written a book about how to create a poem while writing and walking It's very artsy and creative. There are some doodles. It's short and snappy (mostly). There are some longer reflective passages. I think it's very niche audience. Definitely not in my personal wheelhouse. Juan Felipe Herrera is the only son of Lucha Quintana and Felipe Emilio Herrera; the three were campesinos living from crop to crop on the roads of the San Joaquín Valley, Southern California and the Salinas Valley. Herrera's experiences as the child of migrant farmers have strongly shaped his work, such as the children's book Calling the Doves, which won the Ezra Jack Keats award in 1997. He is a Juan Felipe Herrera is the only son of Lucha Quintana and Felipe Emilio Herrera; the three were campesinos living from crop to crop on the roads of the San Joaquín Valley, Southern California and the Salinas Valley. Herrera's experiences as the child of migrant farmers have strongly shaped his work, such as the children's book Calling the Doves, which won the Ezra Jack Keats award in 1997. He is a poet, performer, writer, cartoonist, teacher, and activist who draws from real life experiences as well as years of education to inform his work. Community and art has always been part of what has driven Herrera, beginning in the mid-seventies, when he was director of the Centro Cultural de la Raza, an occupied water tank in Balboa Park converted into an arts space for the community.